There's a lot to unpack in The Rise of Skywalker trailer. After the main sequence ends with Rey and Kylo Ren, we're shown a bunch of scenes, including Ren fixing up his helmet, pieces of the Death Star, Lando, Leia, and a lot more. However, one of the more intriguing parts takes place right after the main sequence when an unidentified space ship descends on what looks like a mountain area with a city built on it. Could the ship in question belong to Rey's parents? Rey's parents' ship was famously shown in The Force Awakens' Forceback scene and the mystery ship in The Rise of Skywalker trailer looks really similar. It is entirely possible that it is just the same model as her parents, but there have been talks of J.J. Abrams retconning what Rian Johnson did with Rey's parents in The Last Jedi. When asked whether or not he would mind if Abrams did so, Johnson said he had zero problem with Abrams doing whatever he needed to do. Rian Johnson admitted to changing up some of the ideas J.J. Abrams and crew had for Rey's parents when he made The Last Jedi. Rey is a nobody and that's the point. Anybody can become something powerful, though Abrams could easily make it as if Kylo Ren was playing a mind game with her in the last movie. When Rey was first introduced in The Force Awakens everybody assumed she was a Skywalker, or a Solo, or even related to Obi-Wan Kenobi. It seemed as if Star Wars fans were looking forward to what would have been a pretty predictable storyline. 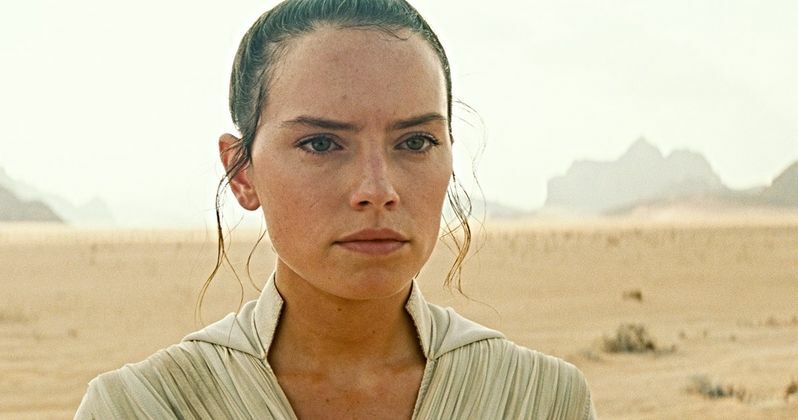 The Rise of Skywalker could end up changing things for Rey and the title might even imply it. But that seems unlikely at this point in time. Plus, J.J. Abrams has said he was happy with the story Rian Johnson told. With that being said, we could still meet Rey's parents in the upcoming movie, even if they're really just nobodies. We could get another Forceback scene, which might be what is shown in the new trailer. We'll just have to wait until December to see. It's been a pretty amazing few days for Star Wars fans. Yesterday saw the avalanche of Disney+ news which confirmed the release date of The Mandalorian and officially announced the Rogue One prequel series. Today gave us The Rise of Skywalker title, trailer, and poster. Star Wars Celebration still has a few more days to go, so expect a lot more announcements in the coming days. For now, take a second (or even fifth) look at The Rise of Skywalker trailer and compare the ship at the 1:11 mark to the one Rey sees in The Force Awakens and decide for yourself. You can see some images below, thanks to Star Wars.